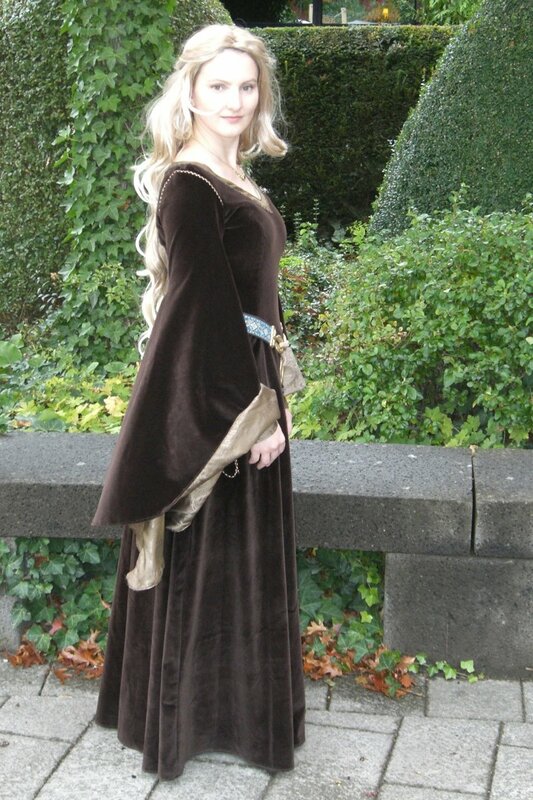 The design of Eowyn’s beacon dress is very similar to Eowyn’s white wool dress. 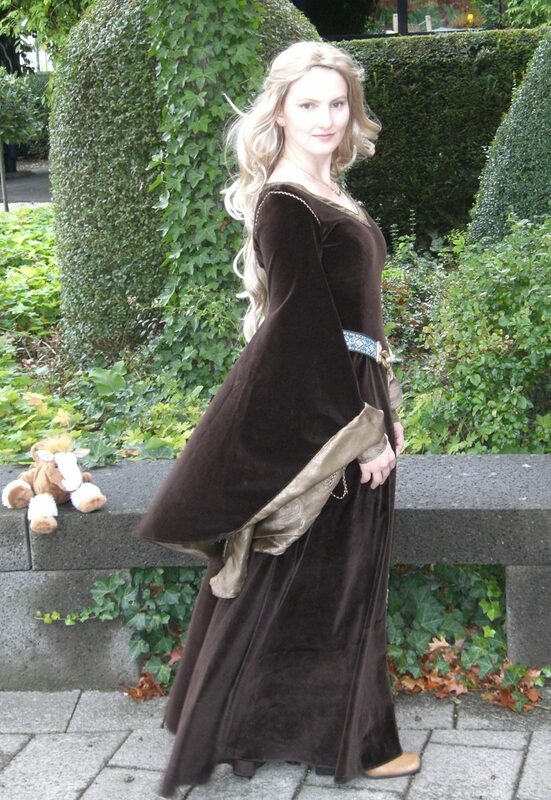 The dress is made of dark brown cotton velvet. In contrast to the original gown, the dress has a waist seam and princess seams in order to achieve a better fit. We are not sure about the shape of the outer sleeves. Are the outer sleeves trumpet shaped like the sleeves of the white wool dress or are they bell shaped like the ones of the green velvet gown? Our guess is that they are trumpet shaped like the sleeves of the white wool dress. The reason for this is the continuity of design: the green velvet gown is nearly of the same design than the funeral dress. 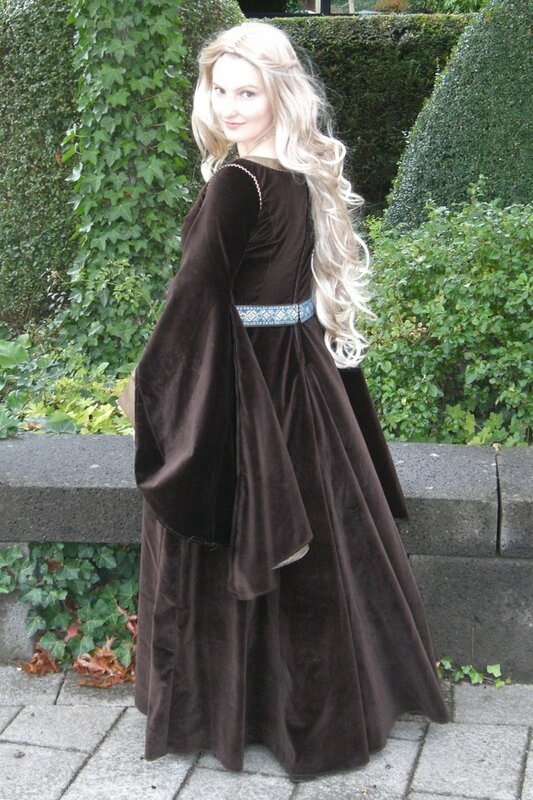 Hence, we think that Eowyn’s beacon gown is of the same design than her white wool dress. Thus, we’ve constructed the outer sleeves trumpet shaped. The outer sleeves are lined with a medium brown, light weight taffeta with a paisley design. 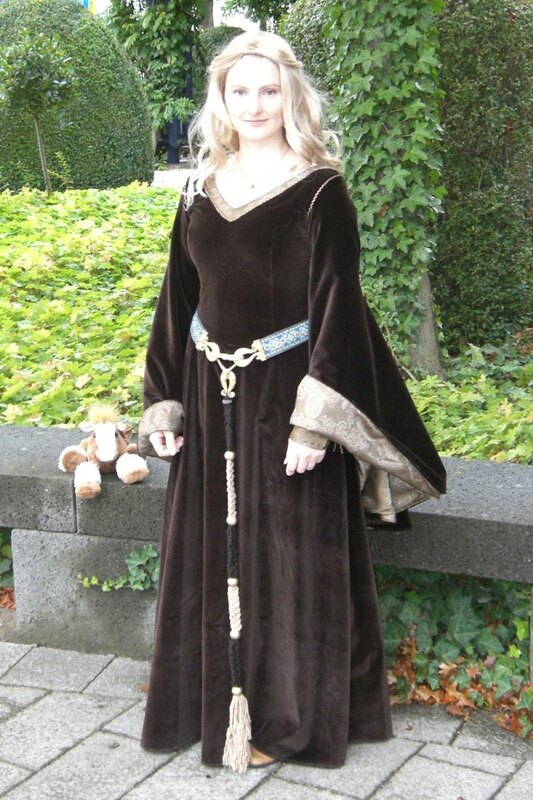 The medium brown taffeta is also used as border at the V-shaped neckline and for the inner sleeves. The border of the neckline and the seam of the armhole are decorated with a zigzag braiding in gold and brown. 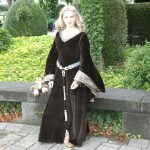 It’s the same type of braiding like used on the white wool dress, but it’s in gold and brown instead of gold and cream. The inner sleeves are tight and laced at height of the forearm. One row of straps is sewn directly into the seam of the sleeves. There’s a dart added at the edge of the inner sleeve and a second row of straps is sewn into this dart. The straps of the lacing and the cord are the same zigzag braiding in gold and brown as used as decoration at the armhole and the neckline. The dress is lined with a beige stretchy fabric and closes in back with an invisible zipper. The Y-shaped girdle is made of a hip belt and hanging ties held together by golden clasps. The hip belt is made of a jacquard trim which is sewn onto brown artificial leather. The artificial leather underlay is a little bit wider than the trim, so it looks like the trim is framed by it. 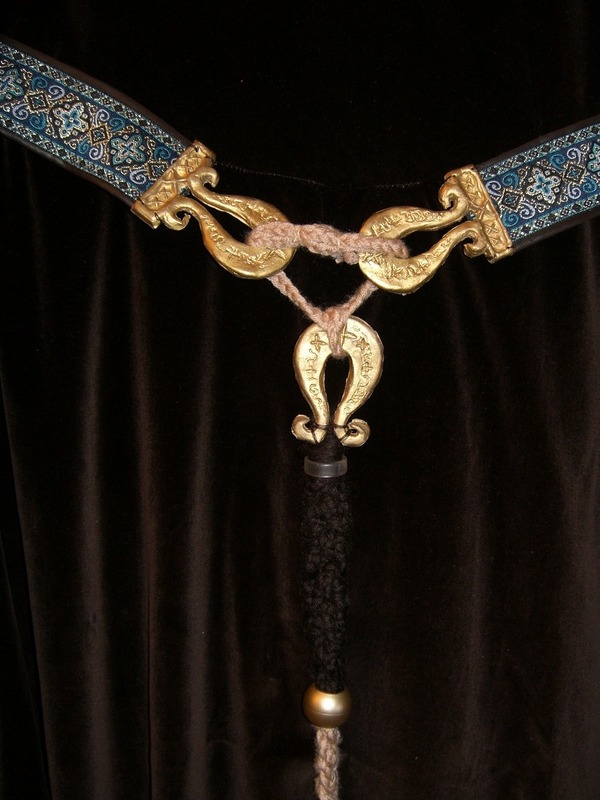 The clasps are made of polymer clay and painted in gold. They are connected by a braided cord of wool in beige. 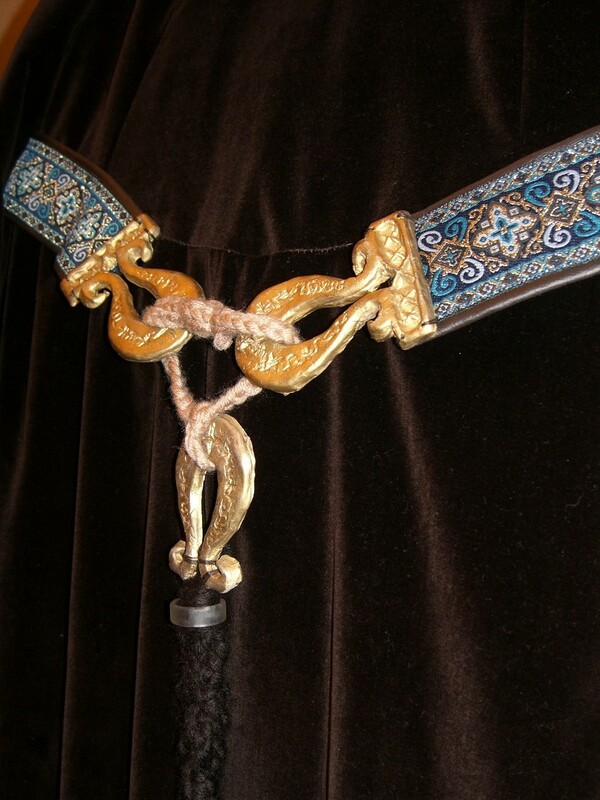 The hanging part of the belt consists of wide braided cords of wool alternating in beige and medium brown which are connected by big golden rings. The flower earrings and necklace are official merchandise, but I alternatively wear another floral necklace with a green stone with this gown.